The Pāla period (750–1150 A.D.), particularly in its earlier phase was a golden age of bronze casting in Northern India. Some of the bronzes are amongst the most elaborate ever cast on the Indian Subcontinent and these small figurines [see EAOS. 70] give little indication of the intricate and multi-figured compositions of the more important bronzes. Nonetheless, the modelling of the feminine deity here is of the highest standard and the whole image is attractive in its proportions and the spacing and arrangement of the elements of what is, considering its small size, a remarkably rich iconography. The goddess stands, her weight evenly borne by each leg, on a lotus base. 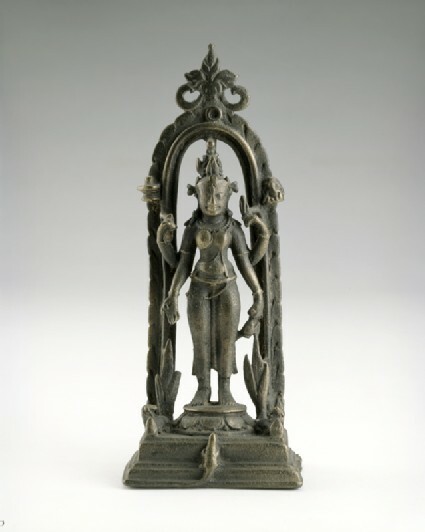 Her upper right hand holds an akṣa-mālā, her upper left an unusual attribute: either fire (agni), a triple rod (tridaṇḍa) or a trident carved out of wood. Her lower right hand makes the varada or boon-giving gesture, possibly holding a fruit as well. The lower left hand holds a spouted jar. On the surround (proper left) is a miniature liṅga with its pīṭha (base); opposite, on the other side, is a tiny image of Gaṇeśa, the elephant-headed god, the son of Śiva and Pārvatī. On top of the pedestal stand two banana plants or plantains (raṃbhā) on either side, with a lion (Pārvatī’s vehicles) and a horned animal, both couchant and facing a little conical object, probably representing a pillar of fire. Climbing on to the base is an iguana (godhā). There is some doubt about the identity of this image. Most of her symbols or attributes here leave no doubt that she belongs to the pantheon associated with Śiva, that she is, in fact, a form of the Goddess, Devī. Others are unusual and highly distinctive, such as the plantain, the iguana and the pillar of fire. There are, moreover, corresponding large images in stone from the same Pāla period, as well as other small bronzes, all of which have been identified as Rambhā, from a reference in the Agni Purāna (De Mallmann, pp.139-40). Recently, however, another authority has claimed that this identification rests on a mistranslation. The difficulty in making a firm identification comes in part from the looseness of the language of so many of the traditional texts, and the lack of absolute consistency, with such rich iconography, amongst images of this type. Other identities proposed for this figure are Gaurī, Maṅgalachaṇḍī and Siddhā.